Medicare Advantage plans have almost 16 million seniors that are currently enrolled. The states that are in the Midwest, South, and West have the highest numbers of Medicare beneficiaries that are enrolled in Medicare Advantage plans. Medicare Advantage plans (sometimes referred to as Medicare Part C) are offered by private companies that are approved and regulated by Medicare. A Medicare Advantage Plan will provide all of your Medicare Part A and Part B coverage, plus some additional benefits like hearing care, vision care, and gym memberships. There's never been an easy way for Medicare beneficiaries to save on services and products not covered by Medicare alone, until now. 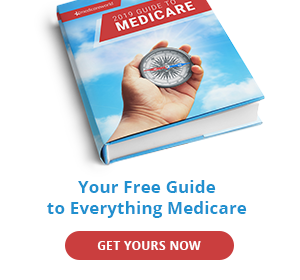 Some companies estimate that the majority will be enrolled in Medicare Advantage by 2021 since about one third of Medicare enrollees are currently in a Medicare Advantage plan now. 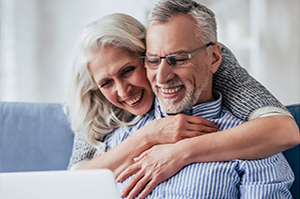 There are over 22 million seniors that are enrolled in Medicare Advantage plans according to the Center for Medicare and Medicaid Services in February 2019. According to data from 2017, there were 19.2 million Medicare Advantage enrollees. 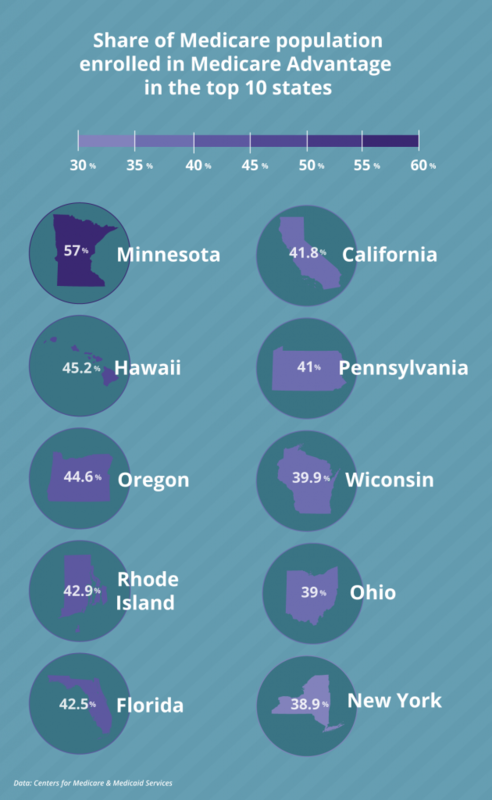 Minnesota is the state with the highest number at 57.3 percent. Minnesota has a plan called Medicare Cost that is essentially a hybrid plan that includes both Original Medicare and Medicare Advantage. At least 40 percent of Medicare enrollees chose Medicare Advantage in California, Florida, Oregon, Pennsylvania, Rhode Island, and Hawaii. 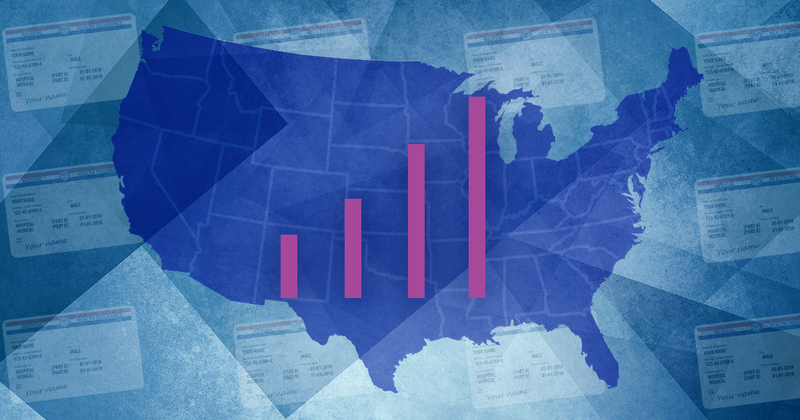 Medicare Advantage enrollment is much lower in the states that have less of a population. The health insurance companies do their research on areas that are more densely populated with seniors. States such as Florida and California have been targeted, but moving forward, other states in the Midwest could also be targeted to increase Medicare Advantage enrollment. Medicare doesn’t cover everything. 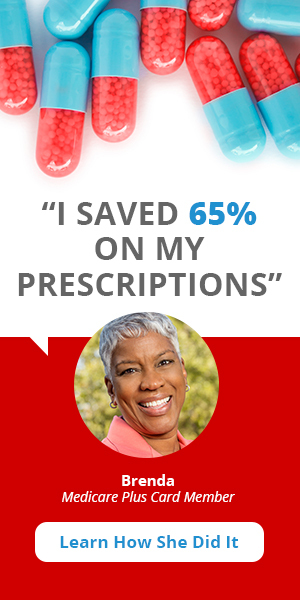 Luckily, those on Medicare can now start saving on out of pocket expenses like prescription drugs, dental, vision, hearing, and more. 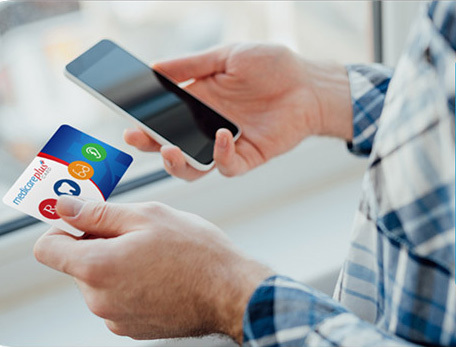 Over 1 million people have already received their free Medicare Plus Card. 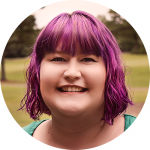 Hannah Verret is a Content Developer at Medicare World in Memphis, TN. Hannah has been working in content creation throughout her entire adult career. When Hannah isn't writing or organizing social media posts, she's spending her time reading and loving on her many pets.